The Royal Hotel is ideally placed from which to explore many of Kent’s outstanding attractions. 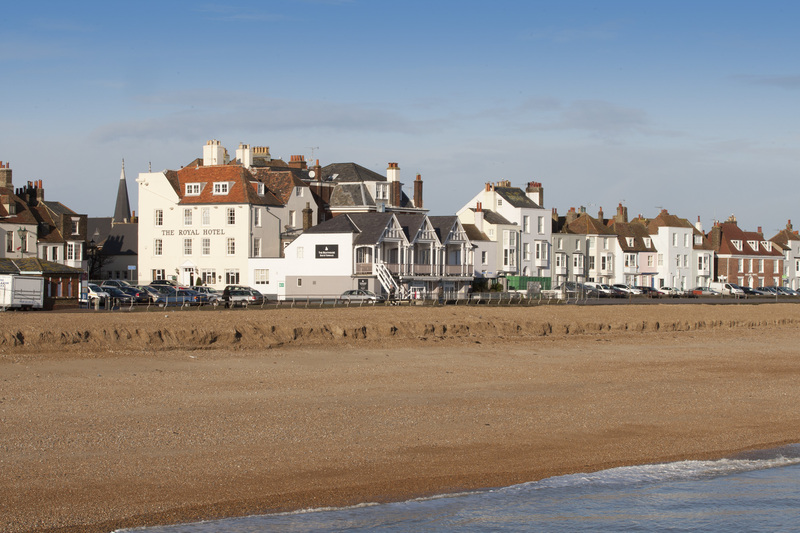 The historic town of Deal has a lot to offer tourists in the way of historic buildings and great family days out. Discover some of England's best castles, which have helped to protect our shores for centuries, or if you'd rather, catch a round of golf at some of our renowned golf clubs. Whatever your interests, The Royal will await your return after a busy day of exploring what Kent has to offer. Deal pier is a significant local landmark, which offers mesmerising views of Deal seafront. If you are an aspiring angler or a fanatic fisherman, this pier is an internationally recognised angling venue. Built during the reign of Henry VIII, this stunning castle is one of many old heritage buildings in the surrounding area. Unique to this castle is its elaborate shape, which when seen from an aerial view, is in the shape of a Tudor rose. Educational yet awe-inspiring, spend a day discovering one of the finest artillery castles in England. Another in the line of castlesbuilt under the command of Henry VIII, this castle is rich in heritage and history. There are many well-known historical characters who have taken residence within the castle, including Lord Warden of the Cinque Ports and the Duke of Wellington. In recent years, Her Majesty Queen Elizabeth the Queen Mother was a frequent visitor of Walmer Castle. Spend a day exploring the castle and its magnificent grounds and gardens. One of the most important castles in English history, from its founding in 12th Century, it has helped to protect our shores from invasion. This is true right up to its use in World War Two as Churchill directed Operation Dynamo from the War Tunnels, which makes up one of the many exciting exhibitions at the castle. Howlett’s Wild Animal Park is a day of wild adventure set in 90 acres of beautiful ancient parkland. As well as having many rare and endangered species, the park also offers special experiences that enable you to take the adventure to a new level such becoming a zookeeper for a day or taking a guided tour to learn more about your favourite wild animals. Visit Wingham Wildlife Park and enjoy a walk on the wild side! Get unrivaled close access to the animals with free roaming birds and wallabies, walk through enclosures and enjoy hands-on encounters where you can meet reptiles, insects and hand-reared mammals. This charity organisation takes care of hundreds of different species of wildlife and is a great place to teach children about the natural world and the importance of preserving it. If you are visiting Kent then a trip to the beautiful city of Canterbury is a must. Experience its history and heritage, stunning architecture and world famous buildings such as the breathtaking cathedral. The city also has a great range of high street and specialist stores. With its ancient buildings, nature reserves, golf courses, delightful country pubs, cafés and restaurants, Sandwich has something for everyone to enjoy. It is one of the best-preserved medieval towns in England and is a principal Cinque Port. Evocatively sited amid the East Kent marshes, Richborough is perhaps the most symbolically important of all Roman sites in Britain, witnessing both the beginning and almost the end of Roman rule here. Explore the huge stone walls which mark the site of this Saxon Shore fortress and take a look at the fascinating museum. Challenge your handicap on the world-famous 2011 Open course as played by the greats. Regarded as one of the world's best, the Royal St. George's Golf Club has a large range of facilities for both the amateur and professional golfer. From the open air driving range to the Pro Shop, their competent tuition and expert advice will prove helpful to all golf enthusiasts. Offering stunning views of the English Channel and the surrounding villages from its site on top on the White Cliffs of Dover in Kingsdown, the course was designed by Open Championship winner James Braid, who was a renowned golf course architect. This golf club is open to players of all ages and experiences, and offers players some unique features, including not least some challenging sea winds! This dynamic visual arts exhibition centre which showcases some of the most talented artists in modern and contemporary art. The Turner Contemporary aims to make art more open, fulfilling and relevant for all, so worth a visit. Whether you are an experienced cyclist or a novice, you will find plenty to enjoy along the 27-mile (43.5km) route on the Isle of Thanet, the location of the first Viking landing in 449AD. The inland loop is on quiet lanes, taking in pretty Kentish villages with ancient churches such as St. Nicholas at Wade and passing Minster Abbey, one of England's oldest inhabited buildings founded in 670AD. A short detour leads you to the 16-acre Monkton Nature Reserve, an important resource for the protection of wild flowers, including rare orchids.